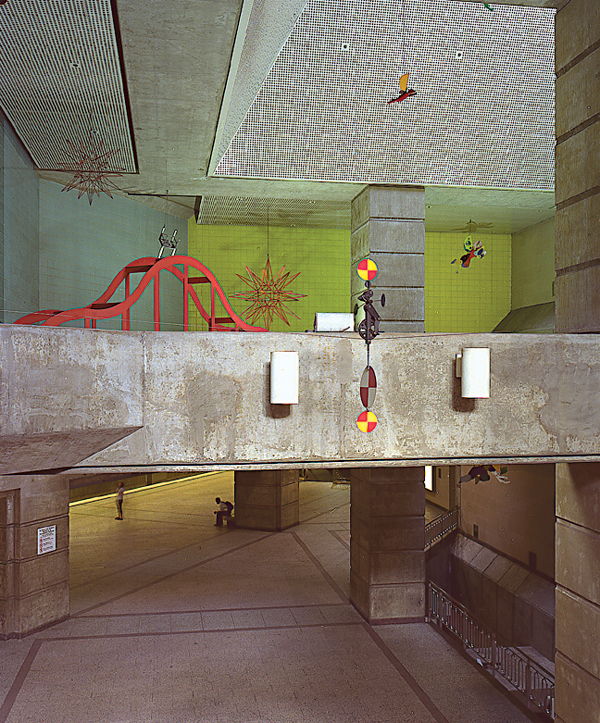 For the Wilshire/Vermont Station, Shire created Los Angeles Seen, a series of sculptures that float throughout the entrance conveying a theatrical, circus-like atmosphere. Several objects, including a large abstract traditional Korean hat shape, stars reminiscent of Mexican craft ornaments, and a utilitarian chair turned upside down join a host of “industrial angels” suspended overhead. A mechanical acrobat on a unicycle traverses to and fro across the station entrance and helps to animate the space. "I have always been interested in industrial objects and my work comments on both the humanity and the inhumanity found in them. This project is a comment on man in today’s industrial world and represents the first time in which my sculpture has taken on anthropomorphic forms—the shapes have become humanoid; they can be read as mechanical people, as angels, or both. While the angels are often seen as funny or cheerful, there is also an impersonal and tragic side to them." PETER SHIRE is a Los Angeles native who was educated at Chouinard Art Institute and was a member of the internationally renowned Memphis Group during the 1980s. His work is in many museum collections throughout this country and abroad. Shire has taught art and design courses at a number of Los Angeles's art and architecture schools. He has maintained a home and studio in the Echo Park area of Los Angeles for many years. Shire's public sculptures can be found in Phoenix, Las Vegas, and in Los Angeles at Elysian Park, and the Academy Village Housing Project in North Hollywood, CA.